Recently I turned to Twitter to see what independent developers struggled with the most, when it comes to promoting their game. Not surprisingly, getting the media's attention was the biggest pet peeve all around, so expect more PR-specific tips to come soon. But I got a more specific reply that echoes what I've heard from developers for a while now, mostly regarding social media: "We should post something every day?! But we've got nothing left to show!" What people love about your game might not be what you thought in the first place: could it be a theme? Something special about the gameplay, the atmosphere, or the art style? That self-awareness is incredibly important for your communications outside of social media too: to get funding, to sell your game eventually, to get the media and content creators to talk about it, etc. so it's really not a step to skip. Do you have to show new game visuals all the time? The short answer is no. There we have it. But what follows is especially true for Twitter where regular posting is important - not so much for other platforms. When you talk with friends and family, you don't always talk about yourself or what you do, do you? You talk about mutual interests, depending on each person you're chatting with. You ask questions, you share cool facts or a funny thing you've seen recently. In your case, tweeting from a studio or game account, those same things apply. Shine light on other creators you like. Ask questions. Get to know your fans - which brings up one of the most important aspects of community building: it is a wonderful market research source. Wondering what people would think is special about your game? Who they are, where they live? You need only ask and/or check your analytics to find out. If you have a non-linear game, consider yourself lucky: you can get loads of different situations to show off on social media. 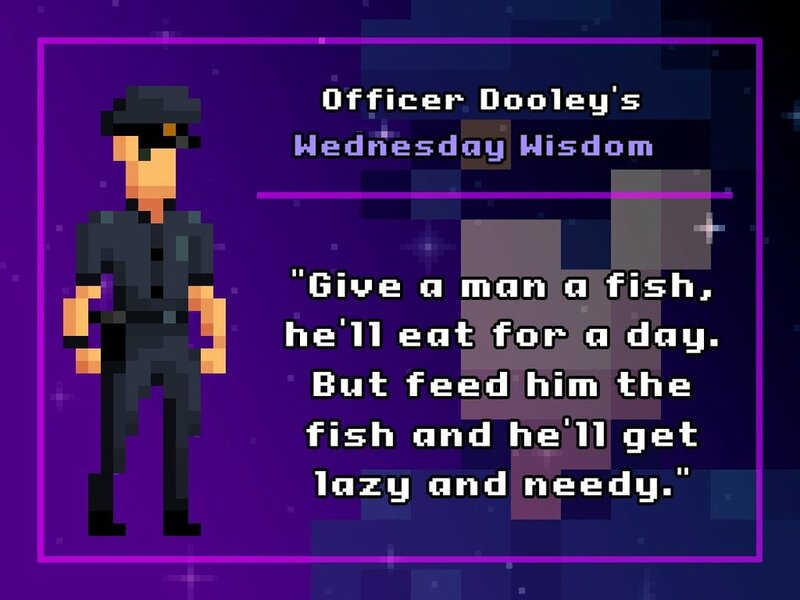 The team jumped on the #WednesdayWisdom tag, adding in Officer Dooley's own statement style to it and creating fake bits of wisdom the character would give. The retro-HD pixel art style was also something the game was praised for. It became a recurring social media feature as they showed the process of creating the art for each scene in a gif. Those were really popular too, and not just with the development community. Spooky Doorway knew these were angles that would resonate with their audience, and yet only one of these shows actual in-game content (the third one, if you didn't guess.) Other posts showed cases or assets that didn't make it into the final game, or seasonal content for example. And guess what? Their engagement rates went through the roof and they rarely ran out of content to post. They might like a few of the things that make your game special: the music, the art style, the humor, etc. There's no issue talking about History, art, books, film or TV if it matches what your audience expects of you. TL;DR: Shift your focus from "what can I say about myself?" to "what does my audience want to see?" and I'll bet anything that you won't struggle so much to find content to share anymore.